Most guests don’t even know about Fantasia Gardens mini-golf. 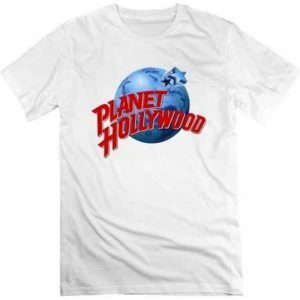 It’s a secondary excursion at best — the kind of freebie they used to dole out on your all-inclusive package, right up there with “free admission” to Wide World of Sports or a crappy t-shirt from Planet Hollywood. Those were real offerings. I chose the shirt. Even Disney Transportation forgets about it. A self-assured Cast Member once instructed me to go by bus from Contemporary to Downtown Disney, then catch another bus to Boardwalk. It was all on foot from there. I ended up in a mangrove swamp two weeks later, covered in bug bites and wearing the hide of a forest deer I had killed with my bare hands. As mini-golf goes, Fantasia Gardens is pretty good. It has that old school Disney charm. Classic and whimsical, packed with hidden gems and challenging holes to boot. Right next door to the mini-golf sit two covered areas known as the Fantasia Gardens pavilions. If you notice them at all, your brain will quickly dismiss them. But come with me down the rabbit hole and you’ll see that this whole sub-complex is just plain weird on every level. Fantasia Gardens is described as being “across the street from the Walt Disney World Swan,” which implies that the mini-golf is tucked away behind a large post-modernist hotel. But in reality, Fantasia Gardens sits at the intersection of World Drive and Buena Vista Drive — the two most heavily trafficked roads on property. So if the Swan is the picturesque backdrop, then the mini-golf course is the foreground, right? But no. The course itself is slightly hidden behind two ginormous picnic pavilions known as Sorcerer’s Apprentice and Dancing Hippo. How is it possible that a pair of forgotten picnic pavilions are sitting on some of the most visible real estate on Walt Disney World property? As one might expect, there is precious little discussion about these open-air pavilions on the Internet. They haven’t been used in years. Plus they’re just picnic pavilions, for crying out loud. Abandoned covered patios are hardly in the same category as sunken islands, jungle ranches, or second-level gift shops. The picnic thing was never Walt Disney World’s bag anyway. When the average guest is dropping a few grand to visit during “free” dining plan season, there just isn’t a market for the PB&J crowd at the local Disney mini-golf. Why Are The Fantasia Gardens Pavilions So Massive? Over at Fort Wilderness, Disney runs a large-scale open-air character dining gig called Mickey’s Backyard BBQ. Picture a few hundred ravenous guests devouring all manner of smoked meats while a mouse in overalls parades around like he owns the place. And yet that entire experience could fit comfortably within the confines of the Fantasia Gardens pavilions, with room left over to host the Polynesian Luau. Dancing Hippo feels like it could store a fleet of corporate jets under the circus-tent roof — and Sorcerer’s Apprentice is approximately 50% larger. What sort of spontaneous picnics were they anticipating after a competitive round of knocking white balls into dancing mushrooms? Did they have dreams of hosting the Jacobs family reunion or a mega-church potluck? They could host an entire RunDisney event in Sorcerer’s Apprentice. Our best look at early Fantasia Gardens pavilion comes from the fantastic Main Street Gazette, in a blog post nearly a decade ago. It shows a simpler time when each vibrant blue pole sported its very own CRT television and an odd little puppet show stage concealed the doors into the pavilion’s central kitchen area. But take a look at the Fantasia Gardens pavilions now and they’re stripped clean. The TVs are gone. The stage is gone. Even the picnic tables have vanished, save one lonely metal monstrosity tucked into the back corner of Dancing Hippo. With its corrugated metal roof, strewn leaves, and foreboding darkness, Dancing Hippo is just begging for its own slasher movie. Things turn downright eerie when one ventures close to any of the odd plastic torch light fixtures, now cracked and covered with cobwebs. A tattered sign in Sorcerer’s Apprentice points the way to the Restrooms. 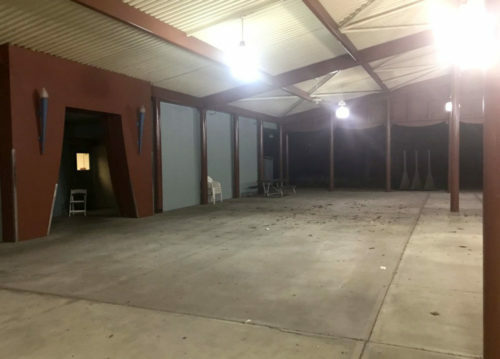 But under the central awning, the doors are stripped clean of any restroom signage and padlocked shut. Even the sign appears off-kilter and off-center, like a political bumper sticker. Back out in the pavilions themselves, lights blaze in the dead of night, illuminating stark concrete floors and echoing rafters. A stray plastic Walmart lawn chair guards the Cast Members Only doors. And above it all, an arsenal of ceiling fans inexplicably continue to run, circulating stale Florida air through an empty hanger. Just in case you thought I was making up the part about the sealed restrooms. 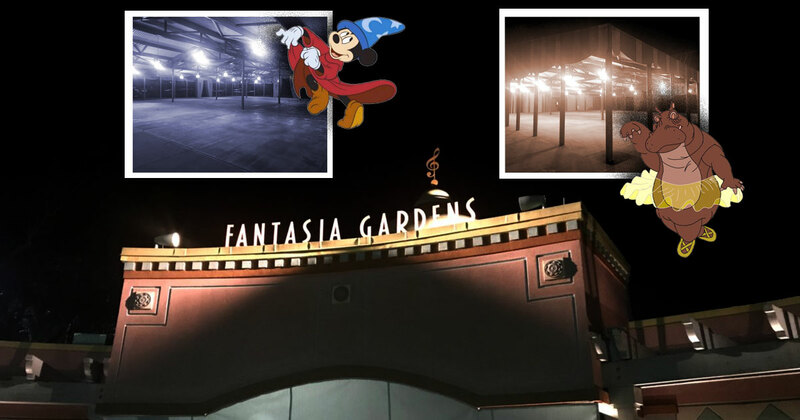 Even as far back as that Main Street Gazette post, they referred to the area as “underutilized.” I can count on one finger the number of times I’ve seen any activity at the Fantasia Gardens pavilion. Another post from Main Street Gazette hints at the true reason for building such a massive facility, via a Disney Magazine quote from nearly a quarter-century ago. Designed by noted American architect Michael Graves, the Garden Pavilions will extend the variety of spaces available for convention functions. 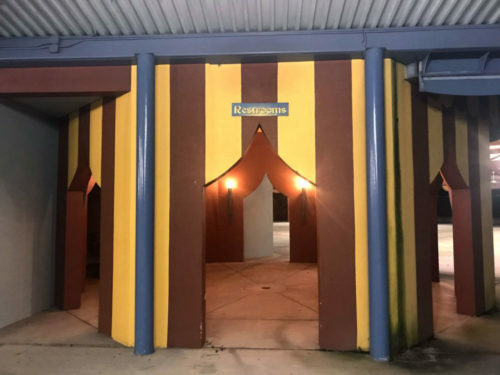 In its open air, circus tent style, the pavilions will capitalize on Central Florida’s outdoor environment with patio decks, a sandy beach with lush landscaping. 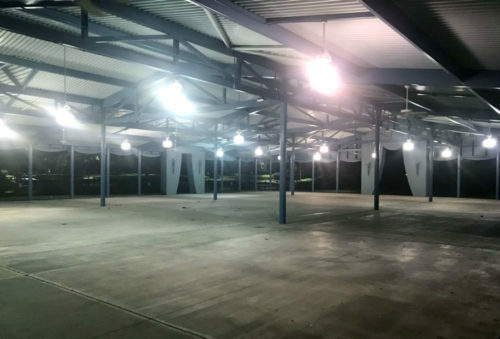 The two connected pavilions will accommodate a single large function or two groups simultaneously. More convention space makes sense. Both Swan and Dolphin are big convention hotels, as is Yacht Club nearby. But the Disney Magazine breezes right past a rather significant fact. Sorcerer’s Apprentice and Dancing Hippo — the mini-golf picnic pavilions with padlocked restrooms and ghostly ceiling fans — are apparently the work of one of the 20th century’s most significant architects. When Michael Eisner set about trying to reinvent Disney in the 1980s, he turned to architecture. Michael Graves designed the postmodernist Swan and Dolphin hotels, dramatically altering the Walt Disney World skyline. A short time later, Eisner enlisted Graves to design none other than his company’s corporate headquarters — the Team Disney building in Burbank. Though a professor at Princeton and founder of his own global design firm, Michael Graves returned again and again to the Disney fold. He designed the Hotel New York for Disneyland Paris and even the Post Office at Celebration, FL. In 1999, he received the National Medal of Arts from President Clinton for his storied career. Michael Graves died in 2015. D23 had many nice things to say about him. Strangely, they mention nothing about a couple of open-air pavilions at the Fantasia Gardens. Graves’ own website highlights the hotels but skips over any involvement in the mini-golf. Yet the Fantasia Gardens pavilion plainly echoes Swan and Dolphin’s stark minimalism and muted pastels. The circus tent motif correlates directly to the hotel interiors. Even the pavilion names fit the pattern. While clearly tied to Fantasia, the pavilions are careful to avoid the character names of Mickey Mouse and Hyacinth Hippo. Michael Graves notoriously did not want Disney characters in Swan or Dolphin. Walt Disney Imagineering may get credit for the mini-golf facility, but Graves’ handiwork is all over the pavilions. The complex opened in 1996, the same year as that Celebration post office. Only a few years later, Michael Eisner began his very public falling out with the company that he helped re-invent. The emphasis on bold architecture diminished. Which means the Fantasia Gardens pavilion might by Michael Graves’ last work with the Walt Disney Company. 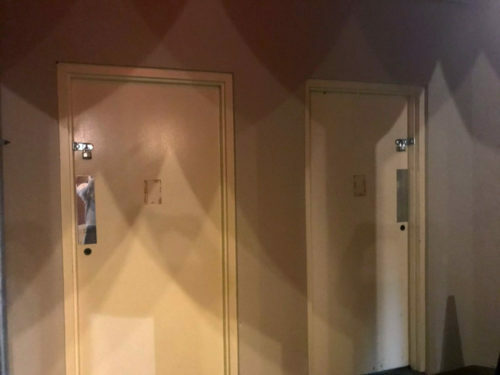 There’s no other way to interpret the stripped, padlocked restrooms. Disney has no intention of putting these pavilions to use. Conventioneers, it seems, are much more interested in private viewings of Illuminations than festive picnics overlooking a putting green. In fact, the pavilions may not be around much longer at all. A planned expansion to Swan is supposed to be going in literally right next to Fantasia Gardens. So for now they sit — nestled against sandy shores, with a row of statuesque palm trees silently marking the time. Their placement is such that it’s inconvenient to even visit them. Though right next door to the mini-golf, a channel of water keeps them a world apart. The lost work of Michael Graves, abandoned in plain sight. This entry was posted in Lost and Abandoned Disney Details and tagged Fantasia Gardens, Walt Disney World Dolphin, Walt Disney World Swan. Bookmark the permalink. ← Parkeology Challenge: Now Riding Every Ride at Walt Disney World is More Fun Than Ever! Great stuff! Coincidentally, Foxxy posted an expose on the pavilions as well, just a couple days later. So weird. I guess the Fantasia Gardens picnic pavilions were a trending topic that week! This is a classic Parkeology post! It’s good to see you guys back! Thanks! It’s the kind of weird thing we enjoy. Hope to do more soon! So the rumors are true. Shane lives! I had followed all of the “Shane sightings” wondering if they were all just part of a big hoax. I mean, come on… someone even claimed they saw Shane working one of the rides at Dollywood. But now, he has made his triumphant return to the world of Disney theme park blogging. Unless he really is dead and someone is just using his name so he/she can grab all that cash generated by the Parkeology blog. Interesting. This may warrant further investigation. Does anybody know for sure if Ted is still alive? Oh, I almost forgot… The Black Hole rules! There’s only one way to be sure. Check if the writing styles match Shane’s earlier posts. I went back and read every prior post. I guess you’re the real deal. Seriously though, always enjoy your humor and writing style. Now you can take some time off for the holidays. I’m dead but I have been posting daily photos for the past four months nonetheless. I always thought the interns posted those pics. And when are we going to see another attempt at the Parkeology WDW49 Challenge from you two? I always have a good stare at those buildings when I visit the mini golf. I’m sure I’ve seen Cheerleaders in those buildings at least once. Real cheerleaders or ghostly cheerleaders? And glad to see new parkeology content. You have been quiet for far too long. We needed some time to recharge the batteries. And it’s good to see you too!